Connectors: QC Type. Female N normally supplied. Pulse width Parameters: >100 MHz 800 us min. 26-99 MHz 1.5 us min. 2-25 MHz 15 us min. Pulse Rep. Rate Peak: 15 pps min. Pulse Duty Factor: 1 x 104min. TPS Series, Terminating Power Sensors are the easiest to use, most cost competitive terminating sensors on the market. This one port measurement device will provide True Average Power for forward power or reflected power if attached to a Directional Coupler or total power in the line if connected to a Non-Directional Coupler. The TPS is a true "plug and play solution" with no front panel calibration required at any time. USB Sesnors 5015 and 5015-EF Include Bird's VPM2 Virtual Power Meter Softaware on CD for stand alone use on most PC computer. The TPS is truly the most economical terminating sensor, half the price of our leading competitors. Quite a value considering the TPS is a highly accurate (5%) device with calibration traceable to the National Institute of Standards and Technology (NIST). Also available in a USB compatible version. Use Bird attenuators for higher power. Peak/Average Ratio: 12 dB max. Accuracy: +/- 5% of Reading. When operating below 100 MHz and above 40 C, add 1%. Use your Bird 43 elements with the 5000 Digital power meters and the optional 5010B sensor! 5014 USB Power Sensor, Bird's VPM2 PC Based Software CD is Included FREE. All of the functionality of the Bird 5000XT Digital Power meter is available on your PC! Uses Bird 43 style elements as well as Bird's DPM and APM style elements. The Bird Directional Power Sensor (DPS) is the most flexible RF sensor on the market today. With this Dual-Socket,Thruline® sensor, you may select from a wide range of Bird Elements to tailor the unit to your needs over a wide range of frequencies and power levels. Also, select field changeable input and output RF connectors from dozens of types including [N, BNC, HN, 7/16 DIN]. 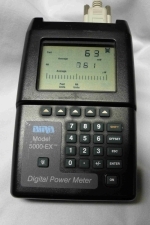 to select elements for the Bird 5000XT and 5000EX Digital Wattmeters. Any DPM or APM series elements are appropriate for the 5000-EX. If the 5010B sensor is used then the standard Bird 43 elements can be used for both Average and Peak power measurements. If the 5010 sensor is used then the correct elements are the APM and DPM series. Power Range: 150mW - 150 Watts Avg. Power Range 500mW - 500 Watts Avg. Soft Carrying Case - 5000-XT, Digital Power Meter The 5A5000-1 Soft Carrying Case is made of Durable Blank Nylon and is compatible with the 5000-XT Digital Power Meter. * Protective Velcro flap, Embroidered with the Bird" logo. * Metal zipper and D-rings for added support. * Durable Storage compartment * Webbed Hand Strap. Case in the foreground is 5A5000-1, case in the background is not included. Cigarette light adapter for 5000EX meters. The 5A2264-09-MF-10, 10ft DB9 Male to Female Extension Cable for Serial/Mono/Multisync with Interchangeable Mounting Extends any DB9 cable. This cable have matched impedance, PVC jacket, molded ends with thumbscrews and inner hood soldered 360 degrees to the connector for complete end to end shielding. FREE with Sensors 5014, 5012A, 5017, 5016, etc. The 5A2264-09-MF-50, 50ft DB9 Male to Female Extension Cable for Serial/Mono/Multisync with Interchangeable Mounting Extends any DB9 cable. This cable have matched impedance, PVC jacket, molded ends with thumbscrews and inner hood soldered 360 degrees to the connector for complete end to end shielding. USB Sesnors Include Bird's VPM2 Virtual Power Meter Softaware on CD for stand alone use on most PC computer. The TPS is truly the most economical terminating sensor, half the price of our leading competitors. 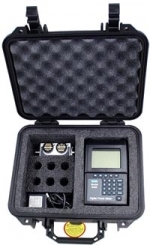 Quite a value considering the TPS is a highly accurate (5%) device with calibration traceable to the National Institute of Standards and Technology (NIST).